At Pinnacle Land Survey Company Inc., we are a recognized leader in land surveying and have been serving home owners, home buyers and developers with their residential land surveys since 1993. 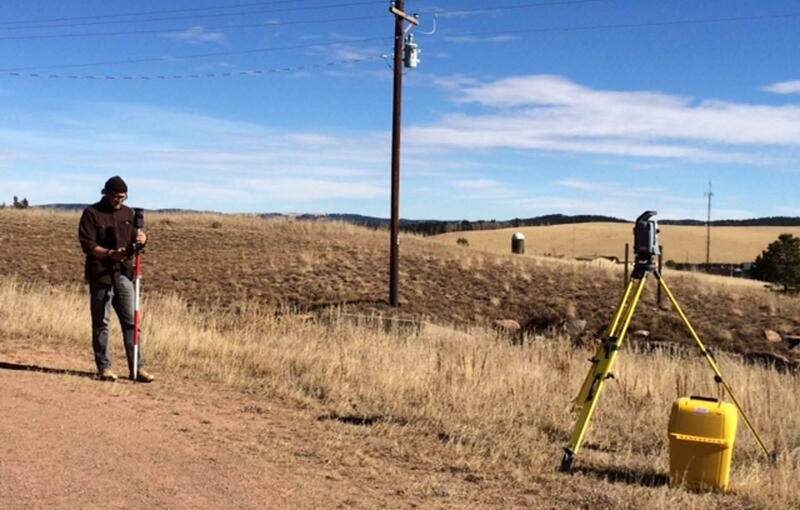 We specialize in residential land surveys in: Teller, Fremont; El Paso, Douglas and Park Counties. Prior to purchasing a property to identify lot lines and encroachments. When you have a conflict regarding lot lines. Just as it is named, a property corner search is performed by a licensed surveyor to locate and identify the corners of a property with brightly flagged or painted wood stakes. For property owners wanting to install fencing, our land surveyor comes out to your property and, if the property corners are existing, then they place stakes along your property line so the fence installer can ensure he is placing the fence on the correct property. For properties under five acres, a small lot boundary survey is used to identify lot lines, easements and encroachments on a property if requested. Upon completion of the small lot boundary survey markers are placed on the property to identify the corners and a certified survey document is created showing the lot lines in relation to neighboring properties, easements, structures on the property and any encroachments. This document is then filed with the Clerk and Recorder’s Office of the county the survey was performed in, per State statutes. The small boundary survey offers the same services and information as a small lot boundary survey but is for properties under 100 acres. The small boundary survey, depending on location, may require more research than small lot surveys. A plot plan, also called a site plan, is an engineering, architectural, and/or landscape architectural plan diagram drawn to scale showing property lines, existing and proposed buildings and structures, topography, distance between structures, distance between structures and property lines, utility runs, positions of roads, landscaped areas, easements and more. It is a necessity in any proposed house construction project. While we call them house stakes, our surveyors will place stakes prior to excavation for any new structure to ensure the excavation team digs at the correct place and depth. After the excavators dig and your foundation is poured, our licensed surveyors will return to your construction site to certify that the foundation was poured in the correct location. Often this is a requirement by your bank prior to releasing funds from your construction loan. Prior to landscaping or changing the landscaping on your property, a grading and drainage certification is useful for landscapers and excavators to ensure they keep positive drainage away from your structures. Regional building may require this to protect the homeowner. Most often required by a title company or mortgage company when a home buyer is purchasing or refinancing a property, an improvement location certificate is a drawing done to scale showing the boundaries, improvements, easements and any encroachments on a property. Even if an ILC is not required by the title company or mortgage lender it is highly recommended to get an ILC prior to buying any property to ensure any boundary issues are addressed prior to purchase. Where an ILC is just a survey and drawing of a property, an Improvement Survey Plat provides an actual survey of the land that shows all improvements, visible utilities, fences or walls on the property in addition to any boundary conflicts, visible encroachments, all easements and any underground utilities that have been located or recorded. In addition, where none exist, markers are placed at the property corners and are documented. If your home is in a flood plain, your insurance agent will order an Elevation Certificate. The elevation certificate is required by FEMA and shows the elevation of your home in relation to the estimated height of flood waters. The elevation certificate is then used to determine your Flood Insurance premium. When sub-dividing land or when public records are incorrect or unclear, our team of surveyors will research, prepare and certify land or easement legal descriptions. Need help finding your mining claim? Our experienced land surveyors can help you locate your claim as well as stake and prepare maps of the claim. If you are planning to subdivide your land and sell off the subdivided parcels, you’ll need a subdivision plat to provide to the county. Our surveying team will survey the land and research recorded documents to prepare a plat map, drawn to scale, showing the new parcels. For customers planning to build a new home and go partially or completely off grid, our solar survey identifies the best position for your home to ensure the most efficient solar utilization year-round. Pinnacle Land Surveying has provided both land surveys and expert witness testimony in land disputes numerous times since 1993. For more information or to receive a Residential survey cost estimate, please submit a request using the form on the right or call us at 719.687.7360.